Help bees - six tips to get you started. Help bees and help youself! Help bees so they can help you. Anything you can do to help bees helps people. Bees are responsible for pollinating roughly 35 percent of the foods we eat and 85 percent of all flowering plants. This means that without bees, we wouldn’t be eating very well, and we certainly wouldn’t be enjoying the beauty of seeing flowers in our gardens. Sadly, due to a variety of factors, bees are dying off at an alarming rate. Lots of effort is focused now on the part of scientists and others, to understand why this is happening. What’s been learned so far points to three main culprits: 1) Loss of bee habitat, 2) Overuse and misuse of pesticides and herbicides, and 3) Recently introduced diseases that affect honey bees in particular. Here are six things you can do. Your starter list for helping bees … get creative! Transform your grass lawn into an eco lawn. An eco lawn typically contains a mix of grasses and flowers. The type of eco lawn that’s best, varies based on factors such as: What part of the country you live in; the amount of shade or sun you might get; the amount of rain you get in your area. Consulting with your local providers of eco lawns can help you decide what type of lawn is best for you. Include more flowering plants in your yard. This is pretty easy to do, and it doesn’t have to cost a lot of money. Plus, adding more color in your yard helps might help to bring a little more joy into your life. Add a bee watering feature in your garden. Bees, just like any other animal, need a lot of water to keep them hydrated. Unlike in your birdbath, you’ll need to add a bunch of small flat pebbles in your “bee bath” in order to give the bees something to stand on when they take a drink. Otherwise they might fall in and drown. Discuss helping bees in the clubs or organizations you belong to. In a garden club: Get a project going that focuses on restoring native habitat in your area, for the purpose of attracting pollinators of all types … in particular, native bees, honey bees, butterflies. 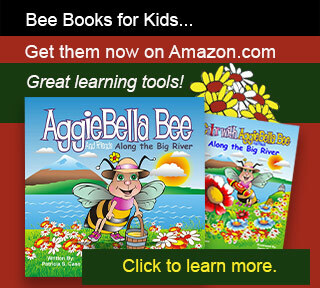 At a summer camp for kids: Put together activities that involve kids learning about different types of bees. For a business/commerce club: Organize a project to identify how commerce in your area might be improved if there were more bees. Pesticides don’t just kill “bad” insects, they kill “good” insects such as bees as well. If you must use pesticides, always read the labels carefully and only use as indicated. 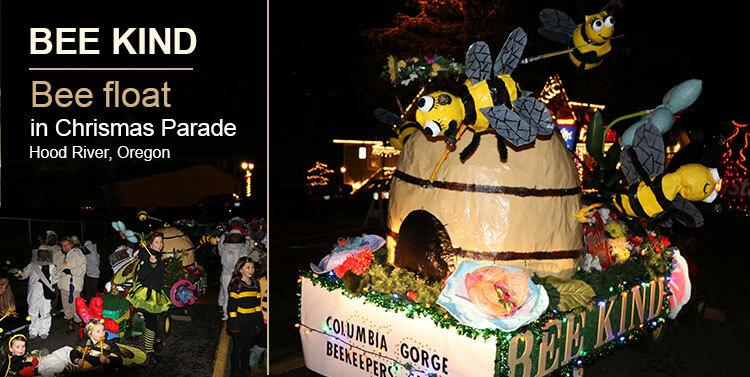 Develop a “bee float” to include in a community parade. Make lots of people aware of bees in a fun and visible way. Shown on this page is a picture of a bee float that was created for the Christmas Parade held yearly in Hood River, Oregon. We invite you to read more about how you can help bees by visiting other bee-related websites to which this website links, as well as the links below.